It’s university admission time, and while some students are checking their OUAC account neurotically for notification of their last few acceptances, other students are taking a more relaxed approach and aren’t even sure what their OUAC password is. While it is not necessary to check your OUAC account daily, we do recommend that students at least log into their OUAC accounts, check their applications, and verify that their marks have been submitted correctly. Schools have been known to make mistakes, so it is important to make sure that your marks are recorded correctly. The Ontario Universities’ Application Centre (OUAC), located in Guelph, ON, has been providing centralized admissions processing for Ontario universities since 1972. (See OUAC background.) Students apply to Ontario universities through OUAC, and OUAC collects grades from students’ schools and submits them to the students’ chosen universities. This centralized system facilitates multiple admissions for both students and universities and saves the duplication costs of universities developing their own systems. Most Canadian universities outside the province also use OUAC to process grades collection for Ontario students. Check your OUAC account to see whether you have been accepted. Students often also receive an email from OUAC or from the accepting university to notify them, when they’ve been accepted. Universities will have received midterm marks from OUAC for all second-semester courses (which is what the universities base conditional offers of acceptance on) no later than May 8, 2012 – so acceptances should be arriving any day now. Universities vary in how quickly they send out offers, but the deadline for universities to respond to students’ applications one way or the other is May 29, 2012. If you’re not sure whether your marks are high enough for some of the programs you’re applying to, you can check predicted grade ranges at eINFO. In addition, some universities require supplemental applications. Make sure that you have submitted all the necessary forms and information for the programs you have applied to. Any reputable or established private school in Ontario will be registered to submit grades to OUAC for their full-time and part-time students. Any school that is not registered with OUAC should raise concerns, or a red flag. At Don Valley Academy, we send final grades for first-semester courses, and midterm and final grades from second-semester courses directly to OUAC. All high school marks from secondary schools across the province are processed centrally through this one application centre, and passed on to universities. It is the responsibility of the Ontario Ministry of Education to ensure that all schools licensed in the province teach in accordance with the ministry curriculum and operate in accordance with ministry standards. Private schools are inspected directly by the ministry to ensure that they adhere to its standards. No matter how hard the Ministry works to standardize education in the province, some institutions will always teach to higher standards than others. However, it won’t benefit anyone to gain admission to a prestigious program with inflated marks, only to fail in the first year. In short, it will always be the job of students and their parents to choose the secondary institutions where they receive the best education. At Don Valley Academy we strive to give students the necessary foundational knowledge – but also the required study skills, work habits, and motivation – to succeed in university. The best way to get straight, unbiased facts about how grades from different schools are handled is to contact OUAC and the Ontario Ministry of Education directly. 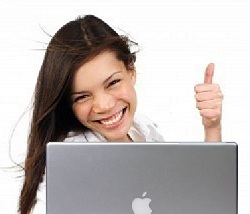 The offer of admission from a university will also contain a deadline for your decision. 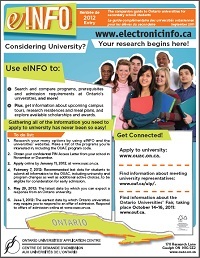 The earliest date by which an Ontario university may require a response (or commitment of any kind) is June 1, 2012. Make sure you make your decision before June 1, or you may risk losing your spot in the program. The deadline for OUAC to receive final grades from secondary schools is July 10, 2012. By July 19, they will have attempted to contact schools that have not submitted final grades. Final grades from summer school are collected by OUAC August 1 to 24, 2012.